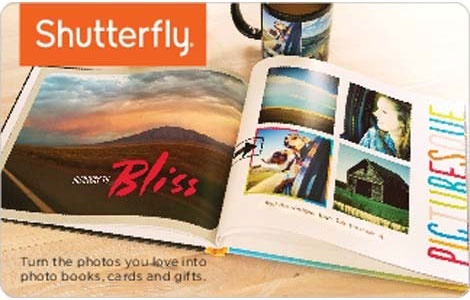 Shutterfly helps you make the most out of life's most memorable moments. As a leader in personalized photos and services, we allow you create lasting keepsakes, award-winning photo books, custom stationery, including cards, announcements, and invitations, as well as unique home decor and photo gifts. We help you connect with your family and friends by sharing your memories and photos in creative and innovative ways. Gift Cards can be applied toward any purchase (including shipping charges and applicable sales taxes) made at www.shutterfly.com. Gift cards cannot be used towards the purchase of products picked up in stores. Your gift card will never expire. To use your gift card, you must have or create a Shutterfly account, and enter the code found on the gift card in your account. Any unused balance will be stored for future purchases and the balance will appear in your Shutterfly account. Lost or stolen cards will only be replaced with proof of purchase. Gift cards may not be redeemed for cash (except as required by law), and cannot be transferred to another person or Shutterfly account. Not for resale. This gift card is issued by Shutterfly, Inc., and its use is governed by the laws of the State of California.